I am super excited for this weekend's release party over at Layers of Color. Make sure you join them for free goodies and loads of fun starting Saturday! I am included in a special blog hop this weekend, so make sure you come back to check it out too! 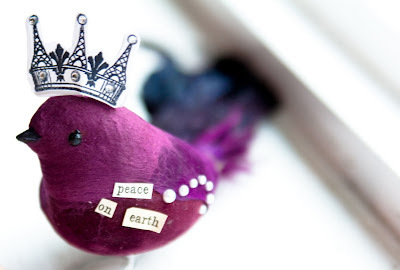 I created this brilliant little birdie for my Christmas tree. I used a bird I got at Craft Warehouse for $1! I then used this stamp from Layers of Color. I stamped 2 crowns, added rhinestones, and then sandwiched them together with a push pin and glue dot. I pushed the pin into his little head. Afterwards I added the dictionary script, and some little pearls. I can't wait to add this to my Christmas tree! Create Well: Think of unique ways to use your stamps for altered Christmas ornaments! So creative....would look so cute as a tree ornament! A pretty bird fit for a royal Christmas tree! I love your creativity, Jen! You give ideas flight! I'm glad you're feeling better! Just in time...see you at the party!